Spring is all about renewal and there's no better way to welcome a new season than by updating your wardrobe and accessories. For me, spring is also a time to appreciate nature and its ever changing ways, which is why I've always felt a connection with animals. I love trinkets that evoke wisdom and strength so you can imagine how happy I was to get a nice accessory upgrade from the Karma and Luck team. I've been obsessed with my new gold plated crystal elephant bracelet with an adjustable drawstring enclosure. Elephants have long been a symbol of strength and wisdom and this bracelet has a much deeper meaning for me than just a stylish piece of jewelry. In East Asian culture, the red string is thought to connect people that are destined to be with each other, regardless of time, place, or circumstances. There are other beliefs about red chord or string that offer an ever deeper spiritual connection- like wearing the bracelet on your left wrist in the Buddhist, Kabbalah, Hindu and Christian faiths. In Western culture, red is the colour of love, youthfulness or excitement. For me, this bracelet is a combination of all these things, with the modern style I love. My elephant bracelet feels wonderful on my wrist and I can see the hard work that went into making it. The Karma and Luck artisans have created some beautiful pieces of jewelry that would make great gifts for anyone looking for something a bit different. 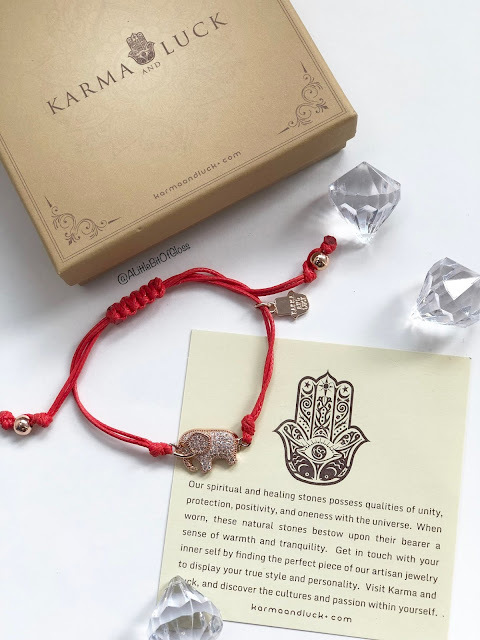 Not only can you find incredible jewelry on the Karma and Luck website, I was surprised to see many resources like a chakra map, feng shui map, information about stones and symbols and other spiritual resources. I learned so much from reading the informative pages and I was able to get a deeper understanding of many things that are important to me. I'm a Virgo, but I didn't know that there are certain stones best suited for my sign- like Amethyst for the mind, Hematite for the body, and Jade for the spirit.